Once you have the infrastructure in place to develop the plan, you’re ready to begin. To help you frame the process, it is helpful to consider the policy development cycle. Like public policy, developing a plan to end youth homelessness involves research, analysis, consultation and synthesis of information. It should also involve an evaluation of implementation and course correction. You don’t have to go through these steps in sequence but consider each as complete the plan development process. Likely, you’ve already identified youth homelessness as an issue and have a sense of what research is currently available. You may have conducted consultations to determine your community’s readiness to develop and implement a plan to end youth homelessness. Additionally, you may know what solutions the plan should include. An effective plan pulls this knowledge together into a coherent strategy – a strategy supported by community stakeholders. 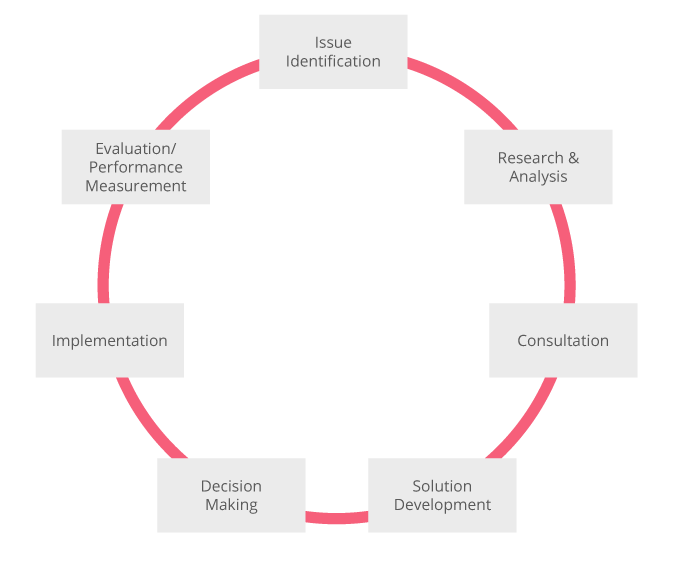 In some cases, the process may seem to move in reverse, from solution development back to research and consultation. This is common and not a sign of failure; you should be prepared to go back to the drawing board as new information emerges or the community context shifts. You will also have to consider what resources you have to complete these various activities. As you consult, develop a means to share findings with stakeholders. Develop a ‘what we heard’ document summarizing learning and implications. Present results through a community forum or by seeking written feedback on the ‘what we heard’ document. Governments developing a youth plan may find it useful to consider the policy cycle process in Alberta. This comes from David French, manager, homeless supports initiatives, family violence prevention and homeless supports, Alberta Human Services who led the development of the Alberta Youth Plan (2014). A Plan for Alberta– Ending Homelessness in 10 Years was approved as a direction-setting document to address homelessness in Alberta in 2011. This plan identifies youth as one of the populations considered to be part of the ‘hidden homeless.’ It goes on to state that Albertans from specialized groups, including homeless youth, are dealing with particularly challenging issues and require targeted responses to be rehoused. The broader provincial plan not only allowed government to become immersed in the groundswell of good work happening in the sector at the local level, but was a key opportunity for administration staff leading the plan’s development to build trust with the sector. Early discussions about the reality of the issue. The need for a holistic response across government and our role as ‘teachers’ began within government. Extensive research was undertaken to review programs and services across Canada and globally to identify promising and best practices for addressing and ending youth homelessness. A research focus was also on identifying policy levers. Calgary released a dedicated youth homelessness plan in 2011, which closely aligns to the provincial youth plan. Both speak to a coordinated system required to prevent and end youth homelessness, emphasize the need for an expanded housing continuum to meet the current need and encourage an improved data system to assist with knowledge mobilization to influence public policy. Supporting young people leaving care with access to counseling and/or mental health services. Conversations with community, including youth who have experienced homelessness, identified the priorities that the plan would have to address to effectively respond to youth homelessness. In total, over 400 Albertans were consulted during the development of the plan. Albertans engaged included youth who had been or were currently homeless, service providers and cross-ministry partners. This is where Albertans ‘got the pen’ and had the opportunity to take control over the work and ensure it met their community’s needs. This component was critical for the government, who recognized that solutions to the issue lie in community. Continuous engagement of stakeholders occurred throughout the dissemination of the information collected through consultation. A ‘what we heard’ document was produced and shared with consultation participants as a means of validating input and facilitating ongoing engagement. Government remained accessible to community throughout the plan’s development to ensure we were always listening and evolving as community evolved. The Youth Homelessness Cross-Ministry Committee was engaged throughout the development of the plan given they were going to be assigned key roles. Key government strategies were leveraged to inform the breadth of the issue across government – hence the early focus on identifying policy levers in the research phase. Key policy levers/strategies were referenced throughout the plan articulating that many components of this work weren’t new; they existed in current strategies/plans and just needed focus on the youth homeless population. The decision-making phase is where contextually each province/state/community will be different. In Alberta, this is where we were well positioned based on the work we did leading up to this point.Alberta moved forward with Cabinet policy approval for the youth plan given it was identifying new policy related to the issue and was requesting new dollars to enhance the response. Within this phase, significant education was required. Briefing leadership, ministers and premiers to defend policy at the various tables was critical. Here, knowing your stakeholders and having strong relationships with them pays off.